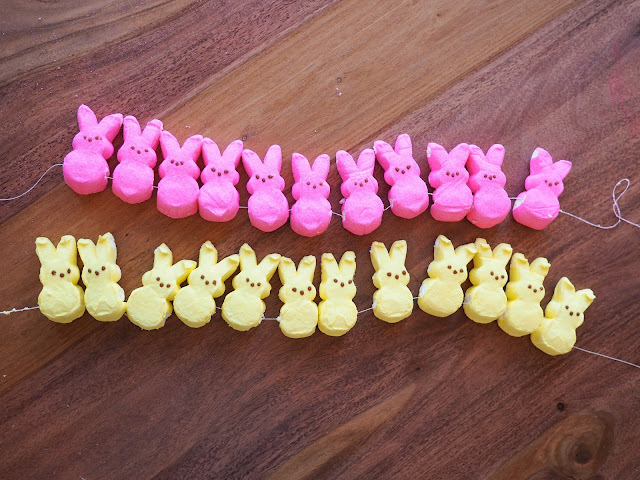 Having spent most of my life in Australia, Peeps are a strange and mysterious thing to me. 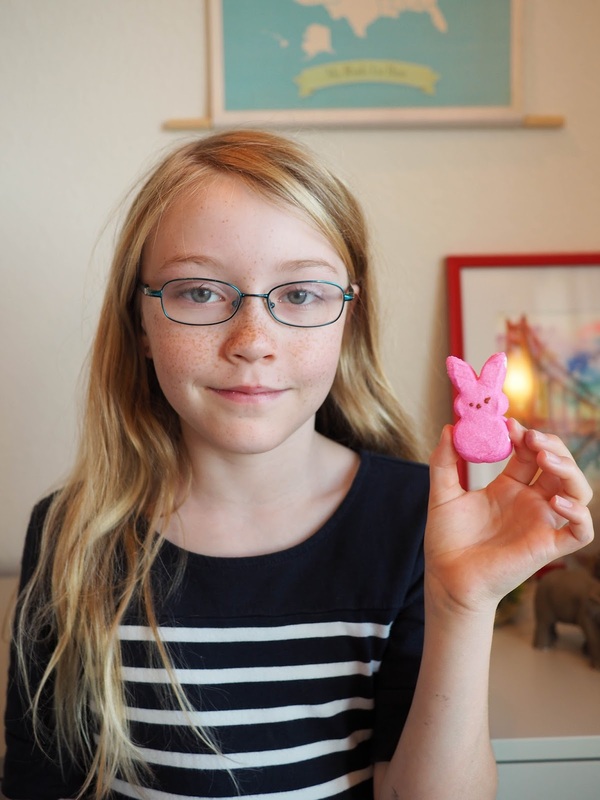 You see, I didn't buy Peeps for my kids to eat. I bought them to decorate with! 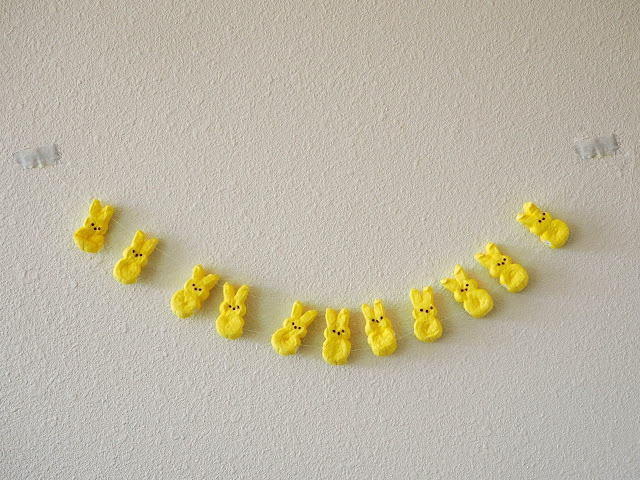 After seeing bunny shaped Peeps in the supermarket I thought they'd look cute strung up together as bunting. So I purchased a couple of packs and the girls and I spent the afternoon getting creative. 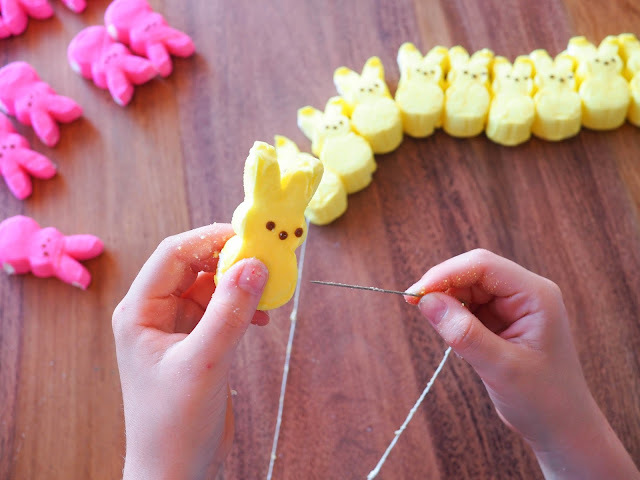 Now, having no experience with Peeps whatsoever, I was not quite prepared for just how sticky these little guys would be under their sugary outside. And oh boy, are they sticky! 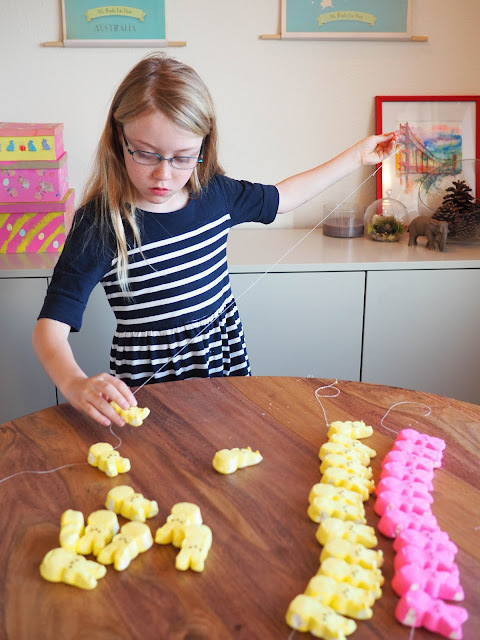 I'm not going to lie, making Peeps bunting is a little messy, but it's a delicious kind of messy! 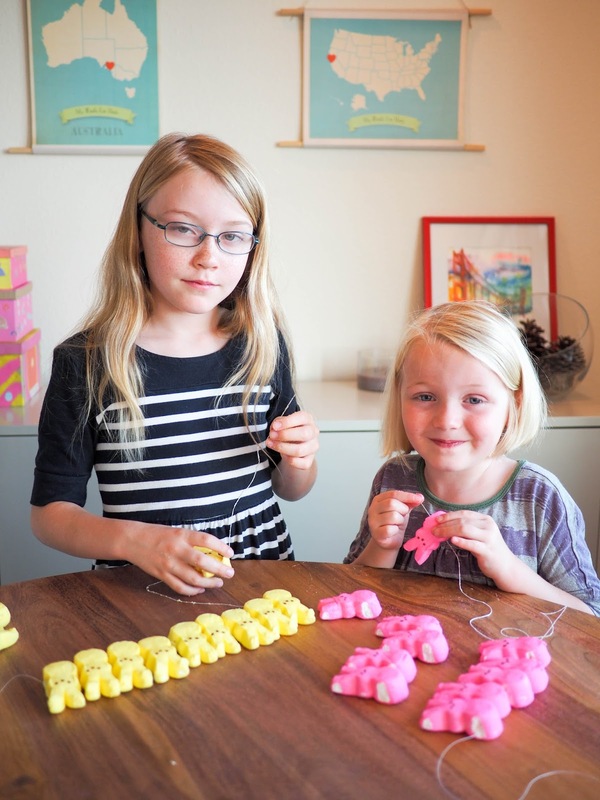 Everything that touched the gooey inside of the Peeps was covered in sticky marshmallow - especially the girls' fingers. The girls didn't mind having to lick their fingers after threading each Peep! Take the Peeps out of the packet and separate them. Measure the door (or where ever you want the bunting to hang) and cut your thread a few inches longer. Thread the needle. 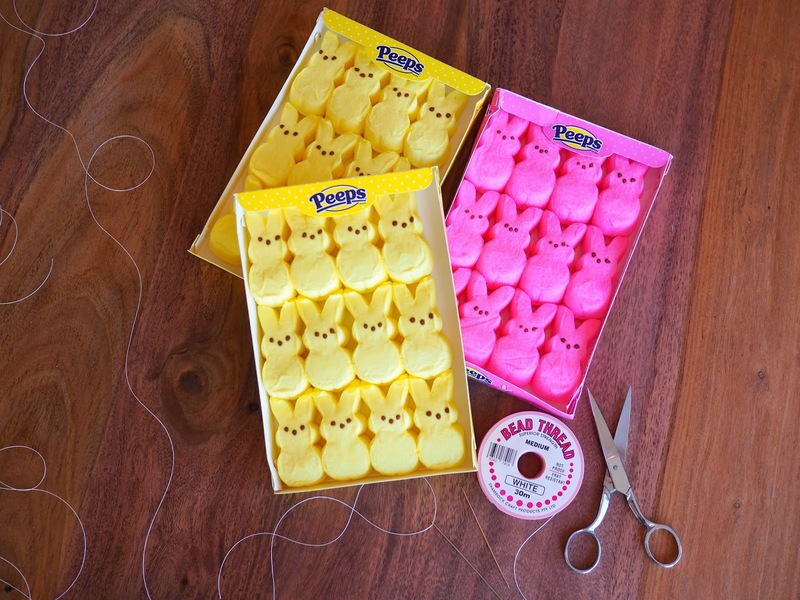 Take your first Peep and carefully insert the needle though the middle of the body. 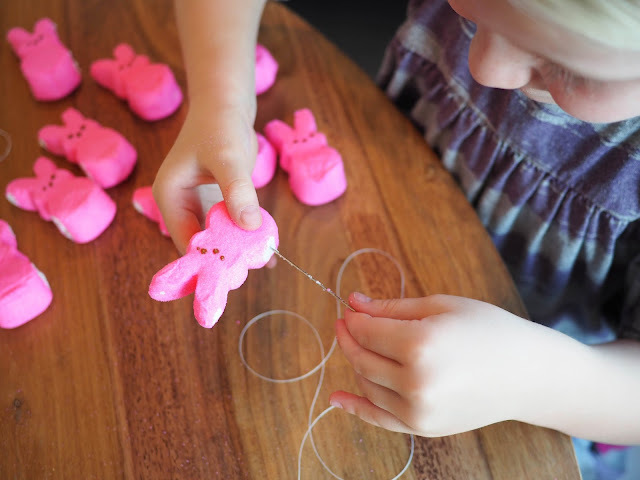 Pull it all the way through and carefully thread the Peep to the other end of the thread (leaving about 3 inches of thread at the end). Repeat with the other Peeps until you are happy with how many you have on the thread. 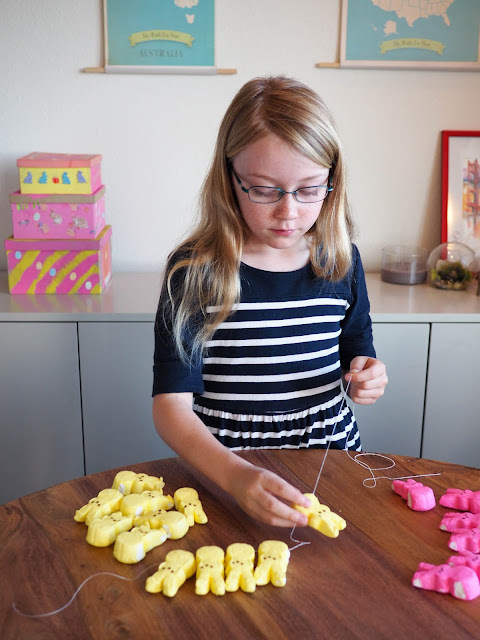 You can make the bunting as long or as short as you like and space the Peeps as you wish, but keep in mind that the more Peeps you use, the heavier the bunting will be. In fact, we probably used a few too many on ours and the Peeps kept flipping over when I hung them up. Keep reading for my solution! As you can probably imagine, the needle and thread get pretty sticky during this process. A piece of wet paper towel comes in handy for wiping the needle and thread clean as you go. It also comes in handy for cleaning your hands, although if your're like my girls you'll probably prefer to just lick them clean! Once the bunting is done, it's time to hang it. This is where it can get a little tricky. I must admit, it took me a while to get our Peeps bunting hanging well on our front door, but I got there in the end. And you guys won't have to make the same mistakes as me because I have a solution. I hung the bunting on our door with tape. I tried a few different tapes but found that regular scotch tape works pretty well. I covered it with silver washi tape afterwards to make it look a little nicer. 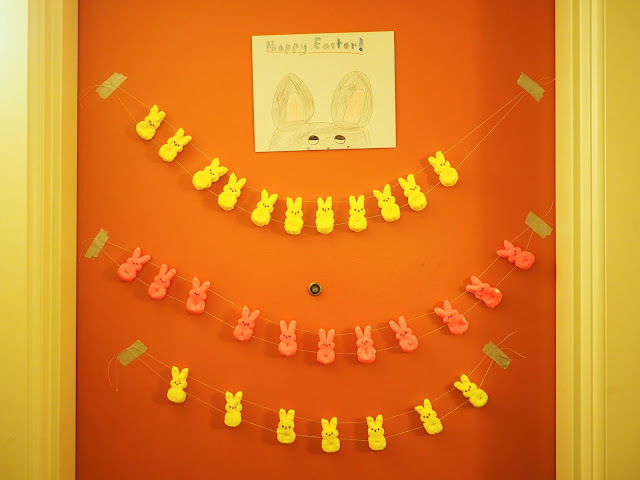 If you were to hang the bunting on a wall, or if you have a wooden door (ours is metal), thumb tacks would work well. When I hung the bunting up, every single one of the bunnies flipped over as they were top heavy. Oops! I hadn't thought of that. I tried sticking each one down with various tapes and Bluetack, but nothing would hold them for very long. Then it came to me. The tops of the Peeps needed threading as well. So with the Peeps bunting in place, I took another length of thread and my needle and threaded the bunnies together through the ears. Voila! Upright bunnies! 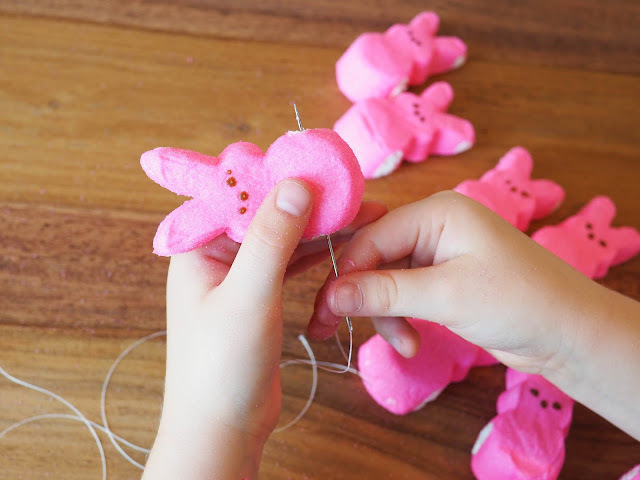 Now, in hindsight, it may have been better to just thread the bunnies through their heads or ears instead of their bellies in the first place, but I feel they're a little more secure with two strands of thread holding them. Now, our front door is orange and the light in the hallway outside our apartment is not working so it's not the best place for taking photos - hence the photos above of the bunting hanging on a white wall. I wanted to show you what the bunting looks like in place though so here it is. When I threaded the bunnies' ears, they had been hanging for a few hours and were quite a bit drier than when first taken out of the pack. 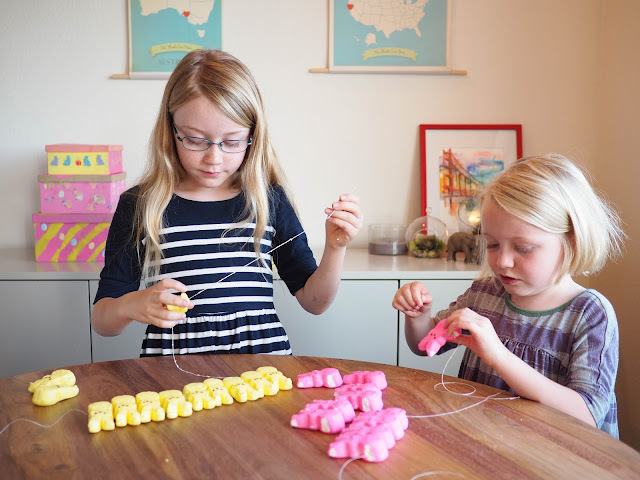 This made them much easier (and less messy) to work with. 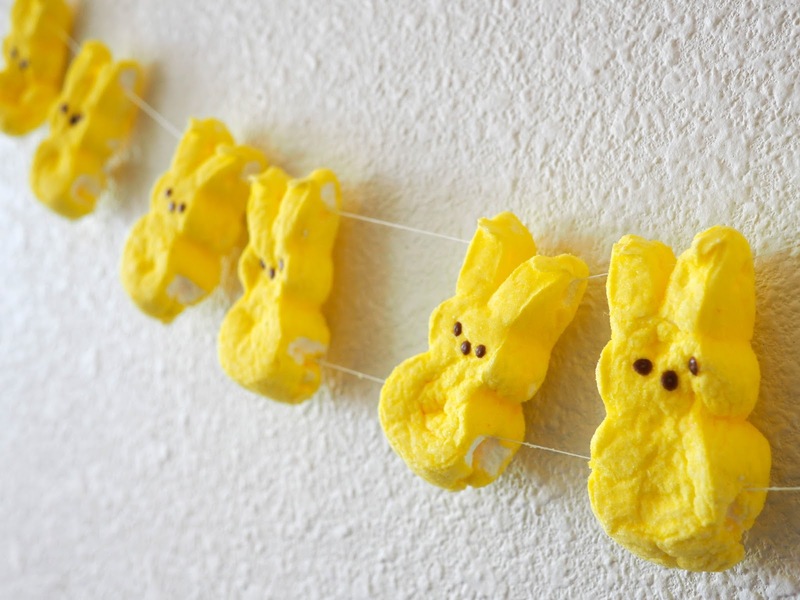 Before starting the bunting, I would suggest leaving the separated Peeps to dry out a little. This will mean less gooey marshmallow guts on your needle, thread and fingers. My kids would probably consider this a bad thing!